P&O Cruises Australia has revealed a bumper Melbourne Cup cruise 2018 line up headlined by Madeline Stuart, the world's first professional adult supermodel with Down Syndrome, a star renowned for bringing style and flair to the catwalks of Paris, London and New York fashion week. Almost 2000 guests on P&O's flagship, Pacific Explorer, will have the opportunity to see Brisbane-born Madeline open the cruise line's highly anticipated 'Fashions at Sea' catwalk show featuring more than 20 local and international designers and brands including Leona Edmiston, Allanah Hill, Swarovski, Nicola Finetti and Sportscraft. P&O's biggest fashion show in history will be produced by esteemed Australian fashion stylists, Fernando Barraza and Amé Delves. Madeline, the international diversity game changer, who has had astonishing success and captured media attention both in Australia and internationally, will be joined by her mother Rosanne Stuart who will partake in a live Q&A about her daughter's rise to fame and how she is changing society's perceptions of people with disabilities one photo shoot at a time. P&O Cruises President Sture Myrmell said the cruise line was honoured to have Madeline Stuart headline this year's 'Fashion at Sea' catwalk show which is now in its 49th year. "Our Melbourne Cup cruises are stand out events in the calendar where guests look forward to donning their finest racing wear to enjoy the fashion parades at Flemington and on our ships at sea," Mr Myrmell said. 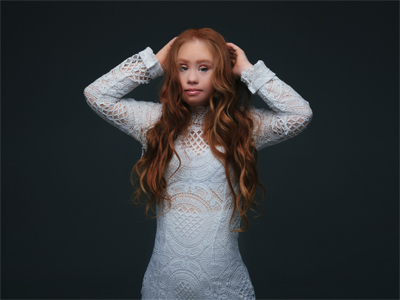 "This year we're extremely proud to host Madeline Stuart and to launch a first-of-its-kind fashion campaign that promotes diversity and inclusion on and off the fashion circuit. P&O Cruises Australia is a contemporary brand and this year's show supports the essence of modern Australia." Nearly 6,000 guests will depart Pacific Dawn from Brisbane and Pacific Explorer and Pacific Edenfrom Sydney to enjoy a jam-packed line up of fashion-themed activities including workshops hosted by one of Melbourne's most in-demand milliners Kim Fletcher who will share the latest trends for statement head pieces and fascinators. Guests looking to maintain their winning streak will also get the chance to participate in P&O's signature onboard annual seahorse racing event where thousands of dollars will be up for grabs in the sweepstake race. Question: What are you looking forward to most about visiting Melbourne? Madeline Stuart: We can't wait to get to Melbourne Cup, it has been on our bucket list forever, hopefully we will get to see Sam Smith play as he is performing there also. We are also pretty excited to see Fashions On The Field as it should be pretty special at Flemington. Question: How are you preparing to attend Cup Day? Madeline Stuart: We went shopping and bought new dresses all round and we are getting Fascinators made by Kim Fletcher who is also hosting millinery classes aboard the ship on the way to Melbourne, it is all very exciting. Question: Can you tell us what you'll be wearing at the Melbourne Cup? Madeline Stuart: There are a few options but the leading option is a yellow dress as yellow is always a favourite and very spring like so it should be perfect. Question: What do you hope to achieve through your partnership with P&O Cruises? Madeline Stuart: We hope that Australia can start being more diversity friendly, we believe it is a positive step that such a large company such as P&O has taken this step and we believe that once other companies see someone taking the lead that will hopefully follow. There is such a large percentage of our country with some form of disability or other so it is normal that we be representing in the commercial space. Madeline Stuart: The day starts with breakfast than gym; it is always good to start any day positively. If we are on the road than usually a photo shoot, fittings or meetings but when we are home it may be literacy programs, outings with friends and dance classes each afternoon. As we spend half the year on the road there is usually two different routines depending whether we are home or travelling. Madeline Stuart: Next year is already getting busy, we are booked for a fashion shows in Jakarta, Istanbul, NY, Paris and Bulgaria so we are very excited about 2019. Question: Where can we find you on social media?